Becker muscular dystrophy (BMD) is an inherited disorder that involves slowly worsening muscle weakness of the legs and pelvis. Use of Gower`s Maneuver or a modified form of Gower`s Maneuver to get up from floor. 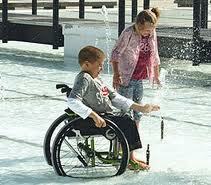 Ability to walk may continue well into adulthood. Non progressive cognitive dysfunction only in rare cases: not as common as in Duchenne Muscular Dystrophy because the brain only needs small amounts of dystrophin. Elevated CPK (creatine phosphokinase) levels in blood: Elevated CK levels are more common at younger ages and decreases later in life, perhaps due to the fact that muscle degeneration occurs more rapidly at younger ages, when there is also more muscle mass to deteriorate. Creatine kinase (CPK) levels may be elevated. An electromyography (EMG) shows that weakness is caused by destruction of muscle tissue rather than by damage to nerves. Genetic test (blood test) confirms the diagnosis. Homoeopathic medicine is showing promising vectors that may replace damaged muscle tissue. Treatment is generally aimed at controlling the onset of symptoms to maximize the quality of life, prevent further deterioration leading to gradual improvement in health status of patients.